We both moved to NYC for a dental residency program. There was an instant bond that grew stronger over the year that we worked together. After 3 years in New York City we both moved to different cities. He came to visit me in Florida and planned a weekend in Key West. It was a gloomy overcast day and he told me he booked a sunset cruise. As we went out to the pier, I realized it was a privately chartered sailboat. Just as we got on the boat, the sky had cleared and it made for a perfect sunset. He brought wine, cheese and champagne and we enjoyed the ride. As the sun began to set, we went to the front of the boat to get away from the skipper. Vivek then read me a poem and at the very end asked me to be his wife!!! Vivek and I were engaged for about 1½ years. Since I was back in another residency and long distance I had to count on Vivek to do most of the legwork. Vivek was a great wedding planner. He did much more than most boys I must say. But, I couldn’t have done it without my wedding planner Samantha Slapnik from Emma Grace Designs. She was incredibly organized through the whole process, but her initiative and calm attitude throughout the wedding weekend made the wedding as smooth as possible. Our wedding was at the Westin in Downtown Charlotte. Vivek’s family is from Charlotte, but my family is from New York. Since there were several days for the wedding, we were able to mix it up. Saturday night was the sangeet, this is a ceremony of singing and dancing.. I wanted it to be colorful and ethnic. There were hookah lounges where the henna lady was applying the henna to the guests. The linens were eggplant and bittersweet so that we could carry these colors throughout the room. We accented the tables with moroccon lanterns to give it a more ethnic feel. On Sunday, the morning ceremony was traditional, but the reception was white and silver and contemporary. My main theme for Sunday was BLING. We had a crystal mandap for the ceremony and then we opened it up for our backdrop for the reception. Our main purpose of our wedding was to showcase how we have maintained two cultures throughout our lives. I have always wanted to wear a Ritu wedding gown. So, I went to India to do all of my shopping. My main stops were Mumbai, Delhi, and Jaipur. For the sangeet I wore a Neeta Lulla lehnga. I purchased this from her boutique in Mumbai. The blouse was green and the Lehnga (skirt) was pink bordered by the same green that coordinated with the blouse. 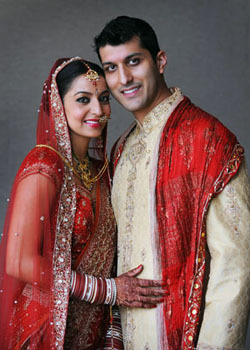 My wedding gown was a red lehnga from Ritu Kumar. I wore a mauve lehgna for the reception as well, but this was not from a designer. However, I did get a special blouse tailored to match the lehnga from designer Sujata Kothari. All of my jewelry was also purchased in Jaipur, India. 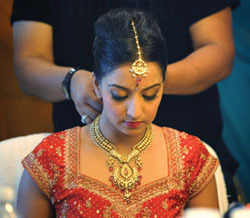 My makeup was done by Bollywood makeup artist, Kapil Bhalla. He arrived the day before from Mumbai. For the sangeet, my hair was half up and loosely pinned. I wore my hair in a bun for the ceremony and wore it completely down for the reception. My makeup mainly focused on accenting my eyes. The groom wore a sher wani, covered in Swarovski crystals from Millionaire in Mumbai along with a red stoll (scarf) and matching pugari (turban). He had a garland of rupees and his face was covered by a “sera” made of beads. There were 12 groomsmen. We had identical kurtas made for them in India. The stolls (scarves) that they wore were dyed to match the colors of the bridemaid’s sarees. The wedding was held at the Westin Charlotte. The actual ceremony took place under a crystal Mandap . The aisle was lined with flowers and pillars that each held a statue. The ceremony took place around a small fire. Sangeet There was reception the night before the wedding (the Sangeet) that was decorated in a morrocan theme. There were two ‘Hookah Lounges” set up where guest could have Menhdi ( henna) painted on their hands. 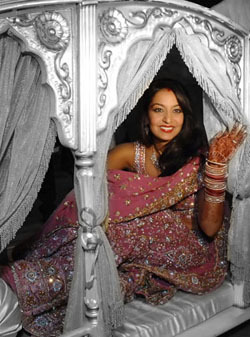 The Sangeet is typically a colorful affair, so there were bright linens and flower arrangements. There were gobo lighting on the walls and low lighting. There were food and dessert stations. Wedding reception The wedding reception was done in light colors. The crystal mandap was opened up to serve as a backdrop to the head table. The linens were champagne and there were a mixture of high mid and low centerpieces with combinations of white lilies and votive candles. The lighting was dim with gobo effects projected onto the walls. As guests were being seated, the DJ played a selection of indian lounge and love songs provided by the groom. The family entered to bollywood music. The bride and groom entered to “Welcome to the Jungle” by Guns n Roses and accompanied by the dhol (a loud Indian drum). The first dance was to Sarah McLachlin’s (one of the bride’s favorite artist) “Answer” The father-daughter song was “Child of Mine”by Carole King. During dinner, the DJ played some a selection of the bride and groom’s favorite downtempo songs. Before dinner, a dance group, including the groom’s cousin brother put on a high energy bhangra performance that ended with everyone on the dance floor. From then on there was mostly popular bhangra dance tracks played. Plan well in advance, but when the day comes don’t sweat the details and focus on the importance of the moment.